The board has now started to cast their votes. 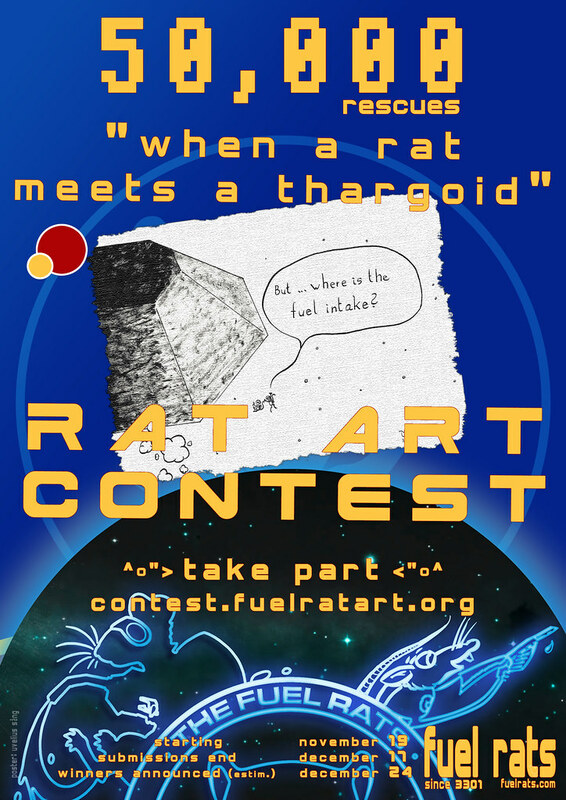 The Fuel Rats Artists Collective is announcing it's first Rat Art Contest in celebration of our 50,000th successful rescue. "When a Fuel Rat Meets a Thargoid"
The winners will receive a gift code (paintjob?) which Frontier kindly offers for this event, a (real, non-virtual) Fuel Rat We Deliver PVC badge, and of course get his or her own entry here at the FRAC. The work has to be connected to the Fuel Rats and Elite: Dangerous. Style, abstraction etc. is up to you. It must be a picture: Drawing, poster, photo, painting, a combination of those, whatever you like. Format: JPG, PDF, PNG, conventional web formats. Resolution and size is up to you ... as it fits best to your artwork (well, maybe not 1200 dpi and more ...). Must be downloadable or sent to us. The FRAC contest board members will cast their vote in four different categories. There will be the main winner, and the winner in each category. Submit your contribution via sending us a link to your file at a hosting/cloud service like Dropbox, Box, flickr and imgur. You might also post it in the 50k FRAContest forum thread, which will be launched at November 19th (any earlier submissions are not accepted). Note that we must be able to download your image file. Well and of course it's PG13. By contributing, you agree that the Fuel Rats Artists Collective, as well as the Fuel Rats player Group and Elite: Dangerous/Frontier, may display and distribute your picture under the Creative Commons License 4.0 by-nd. We need a way to contact you, solely for the purpose of this contest. Please leave an e-mail address or valid forum nick so that we can contact you in case that you are among the winners, or have further questions on your submission or the contest. We'll not use your contact details for other messages, if not asked to do so by yourself. Note that details may be subject to change before November 19th.